The show memory exec command is often used to check the amount of a router’s free memory. In troubleshooting cases where router performance is the focus, this is a major command used to see the statistics about the router’s memory. To show memory used, use the show processes memory EXEC command. Syntax Description: This command has no arguments or keywords. 10.0 This command was introduced. Total Total amount of memory held. 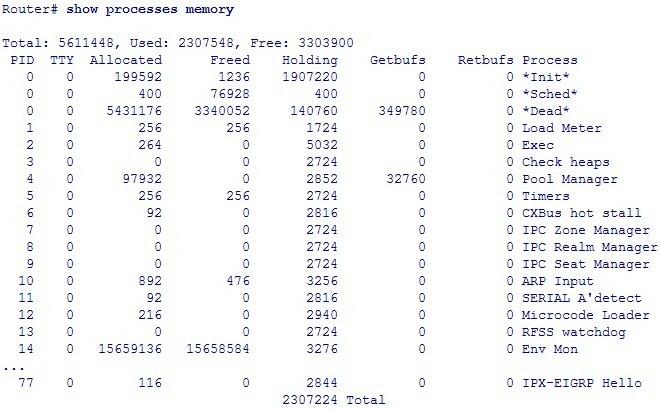 Used Total amount of used memory. Free Total amount of free memory. TTY Terminal that controls the process. Allocated Bytes of memory allocated by the process. Freed Bytes of memory freed by the process, regardless of who originally allocated it. Holding Amount of memory currently allocated to the process. Getbufs Number of times the process has requested a packet buffer. Retbufs Number of times the process has relinquished a packet buffer. *Dead* Processes as a group that are now dead. Total Total amount of memory held by all processes. show memory Displays statistics about memory, including memory-free pool statistics. show processes Displays information about the active processes. The following example displays a sample output (partial) of this command executed on a Cisco 2514 router. The show memory exec command’s output is organized in separate sections. In the first section you can see the summary statistics about processor memory and I/O memory (see the example of output (partial) of this command executed on a Cisco 2514 router). Then you can see the more detailed (block-by-block) display of memory information first for the processor memory, and then for the I/O memory. The output is not uniform across different router platforms. For example, if you execute this command on a Cisco 7000 router, the output will include processor memory and multibus memory statistics. If you execute this command on Cisco 4000 series routers, you will receive information about SRAM and I/O memory as well as processor memory. In all cases, the processor memory statistics are shown. You must pay attention to the total amount of memory, amount used, and the total amount of free memory.